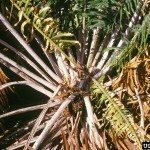 I picked up a Sago Palm and have had it approx 2 years... with the longest leaves perhaps 20 inches long. Three new leaves have finally appeared from the base and are still growing, reaching over 4 1/2 feet, looking very out of place from the former plant. We are in an extreme heat wave with high humidity and I wondered if this is contributing to this burst of growth. It no longer looks like any photo I've seen of Sago Palms. Has something wrong happened to it? Thanks!! Since it is at the base, if the leaves all grow from one spot, the new growth is a pup. These can be left on the plant or removed to create a new plant. If they encircle the plant, this is truly fronds on the plant. The very long leaves typically indicate that the plant is not getting enough light. It will stretch its leaves out to try to get more light. Moving it to a brighter location will help prevent this.